If you are new to polymer clay, you probably don’t know that some brands (in particular the Polyform brands) retire colors and release new ones periodically. Here’s what is new in Polyform’s Sculpey III and Premo! clay lines for 2015. Each clay color has a full review here on the website. To get to each review, CLICK on the color name below. To make the color recipes shown below, use the colors within the same clay line. I am saddened by the discontinuation of Navy, I used this a lot and relied on it heavily. I’m not sure this will be close enough for avid users of this clay. There was more than just embossing powder in the clay, perhaps a little ground pepper would work also. 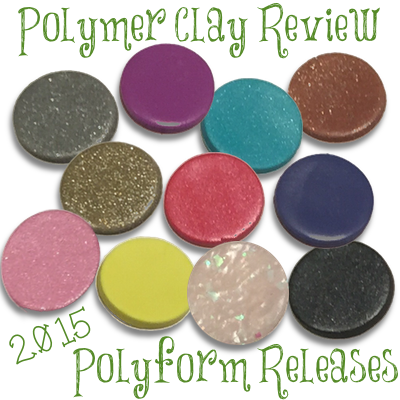 The polymer clay for this review was generously provided to me by Polyform. For the White Granite, I’d do a little bit of White Translucent in with the White (1:4, 1:5 mix, maybe?) and add white and silver glitters as well as the embossing powder, and perhaps a small amount of a light gold glitter as well. I’ll have to do some playing with it. I make my own variation of granite (since it doesn’t sell in pound blocks and I used a lot of it). For that I start with Translucent (grey always came out looking “flat”), various colors of glitter, and white and black flocking powder. I have pre-mixed a large batch of the glitters and powders so that when I need more granite, I just have to reach for the jar and blend as needed. Sadly, flocking powders seem to have vanished on me, so when I run out I’ll have to try the embossing powders. Thanks for sharing your recipe Mitz! Flocking powders are sometimes hard to find in stores as well. They were popular for awhile and don’t seem to be anymore.